This is sent to you from the residents action group RAG in Cranage Cheshire. Regarding the upgrade to a smart motorway from junction 16 to 19 by Highways England and the noise and pollution emanating from the M6. Recently following a freedom of information request made by Cranage Parish Council and the Resident’s Action Group to Highways England, certain documents were released. These documents contained some very startling information; they contained some 1500 private addresses that were used by Highways England in the computer modelling for noise that exists at present emanating from the M6 along with the predictions for when the smart motorway will be completed. Every one of these both existing and predicted was listed to be way above the world health authority along with the EU limits for safe health of residents. That is 40 decibels at night and 55 decibels daytime. The consequences from noise at these levels are set out in the WHO night time noise report. They include mortality rates that lives are shortened. Blood disorders and cardiovascular links including strokes and heart attacks. Other studies show links to concentration being lowered prompting concerns over people using equipment that could lead to damaging themselves or others. Mental health is also linked both in adults and children. The list in the WHO 184 page report is comprehensive and very disturbing and presents a very serious cause for concern. It’s estimated that just from the highways document, which doesn’t include every property in the catchment area, some three thousand residents and that’s a conservative estimate will be affected. Yet highways refuse to accept that there is a problem and insist that what they are doing is not significantly making things worse, totally ignoring that there was a problem to start with. In 1994 when it was proposed to add extra lanes to the M6 the then Highways Agency stated that there was a problem over noise in Cranage and proposed to erect a noise fence on top of an earth bund to protect residents. Now we have traffic levels predicted on completion to be double those in 1994 yet the highways England now say there is no problem. What also came to light was that they failed to include all residents within 600 meters of the M6 when applying mitigation; indeed even some within 300 meters were not afforded the opportunity to apply for grants to improve their properties. All of which are required by the environmental assessment. In their covering letter to the documents released they make the statement that they will not correspond with the parish council and the residents group further . This coming from a public body is absolutely disgraceful and shows a total lack of respect and arrogance that is beyond belief. Highways failed to do a full impact assessment required by statute, they requested this to be waived by the minister for transport without him being fully given the facts. That they failed to even carry out the environmental assessment correctly and excluded residents that should have been offered mitigation. That they failed to take actual night time noise readings, again a requirement even in an environmental assessment let alone a full impact assessment. Yet refuse to do so, but Its noted that the M40 is benefiting from noise absorbing fences so why are we being excluded. The pollution is another aspect of concern coming from the M6, its very apparent that with no hard shoulder the M6 very quickly comes to an halt when an incident occurs leaving stationary traffic belching out pollution this happens several times a day on this section. This section of the M6 junction 17 to 19 is one of the most if not the most disrupted section on a daily basis in the motorway network, figures obtained show this to be correct. With no hard shoulder it becomes very dangerous for users, indeed the all-party commons committee stated that a halt should be made till further research into the safety of smart motorways is carried out. The results of every incident lead to all the adjacent roads becoming heavily congested with the increase in pollution to even more residents. The cost burden to the health service resulting from the reduced general health by residents affected and these include children must be enormous. Highways stance as always been that what they are doing is not significantly making things worse from the level of noise that already exists, and that this does not require them to deal with the problem, yet under the mandatory requirement set out by government it clearly states that a full impact assessment is required for such a scheme as this upgrade of lanes etc. The fact they requested a dispensation from the then minister for transport to not do a full impact assessment and to carry out only the lesser environment assessment shows a clear intent to circumnavigate the law. The recent details from highways England revealed under a freedom of information request made by RAG and Cranage Parish Council are a cause for concern. This document produced by RAG sets out to highlight several aspects of the FOI documents received. In the first part of their covering letter they refer to the distance from the motorway that should be part of the consultation zone and apologise for the fact that 300 metres was applied not the 600 meters that is the statutory requirement even at 300 metres several residents were excluded from consideration for mitigation measures. FOI request showed that highways England had used a computer generated model for noise levels on 1500 properties along the M6 from junction 16 to 19 . The model showed that not one property was below the level for night time noise of 40 decibels recommended by the WHO and by the directive issued by the EU to all member states. It also showed and they stated they had not carried out any real time observations for night time noise. We would draw attention to the roads and bridges design documents set out below. I RAGs view the M6 scheme falls into this category that requires a full environmental impact assessment to be carried out, this highways have failed to do by only doing an environmental assessment. We also note that highways use the physics lab method of calculating noise levels by computer generated modelling , the physics lab also note that this does not factor in any elements for wind direction and weather conditions. Also it should be born in mind that the section that runs through cranage is mostly flat with no embankments. Leading to exposure from wind carried noise. Up to 30 dB Although individual sensitivities and circumstances may differ, it appears that up to this level no substantial biological effects are observed. night,outside of 30 dB is equivalent to the no observed effect level (NOEL) for night noise. level (LOAEL) for night noise. groups are more severely affected. population is highly annoyed and sleep-disturbed. There is evidence that the risk of cardiovascular disease increases. It should be noted that this refers to night time levels taken outside not inside a misconception applied by some. Further we would also draw attention to the EU directive and its amended directive 2011/92/EU 16th April 2014. Which contains numerous paragraphs underlining the requirement to carry out a full impact assessment for such a scheme that the M6 falls under. · where possible, contribute to the improvement of health and quality of life. Further there are safety concerns raised by the all-party House of Commons Transport Committee All Lane Running 2016-2017 . In their report they state and highlight the following. lower cost than traditional road widening. Te fact that All Lane Running is the least costly of the scheme designs cannot be challenged. That this involves the loss of the hard shoulder, resulting in a risk to safety, is another matter and is not justifiable. Running as safer alternatives. Te cost saving of All Lane Running cannot justify the increase in risk of certain hazards. 78. Te Department would do well to decouple its thinking, and not assume that the loss of the hard shoulder is essential for the installation of a controlled environment. putting people’s lives at risk, in order to cut costs. spaced at the same distance. Again you will see that an environmental impact assessment should have been carried out. Noise. For example, about 57 million people are annoyed by road traffic noise, 42% of them seriously. which tends to be followed is set out in the Design Manual for Roads and Bridges. minimise any adverse noise impact. This process also has regard to the protection of tranquil areas in general through consideration of the impact on landscape. mitigated by the use of earth mounds, barriers and planting. That highways should have carried out a full impact environmental assessment which would have included a night time noise assessment. That highways failed to implement the correct distance for consultation and possible mitigation. That 1500 residential properties are being subjected to a noise level that is above the EU and WHO directives which means conservatively over 3000 residents are directly impacted. 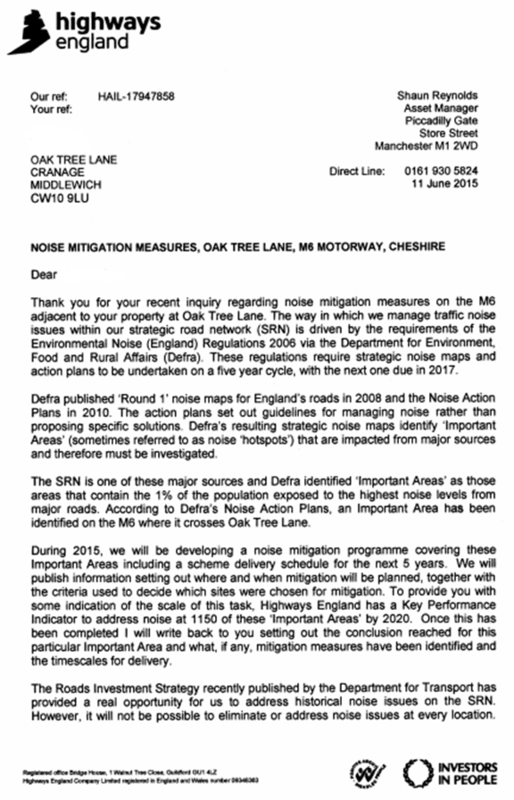 That in june 2015 its stated a noise hot spot or important area was designated by Defra for oak tree lane in Cranage. Mike Hodge Cranage Parish Councillor, Stuart Jackson .